Alphonse Beauty Microblading: Permanent Eyebrow Makeup in Michigan - What is Microblading? Would you consider getting a tattoo on your face? The average woman would argue ‘absolutely not’. However, if you asked the average woman if she would like perfectly shaped natural eyebrows that do not require makeup, she most definitely will ask, “How?” If you are looking to learn more about the newly emerging cosmetic procedure Microblading, you’re in the right place. Microblading is definitely not the eyebrow tattoos of the past. Trends in the early 2000's saw women shaving off their eyebrow hair and tattooing unnatural-looking dense lines in their place. This procedure was permanent and left no change in the desired eyebrow look. Do you remember when you were younger and plucked your eyebrows down to a thin low arched shape? Is that the same look you are going for today? Maybe but maybe not. Point is that eyebrow trends change. Placing a dense unnatural eyebrow on your face that cannot be altered or changed is… scary. The process is conducted by using a manual tool, which is comprised of 10-12 microneedles that are several times thinner than a traditional tattoo needle, to draw thin individual crisp hair strokes into the skin. Unlike permanent tattoos that penetrate to the deepest layer of the epidermis, Microblading only penetrates the top 1-3 layers of skin allowing the process to be semi-permanent. The strokes are saturated with tattoo pigment which then heals over to retain the desired color. The strokes compliment your existing eyebrow hair to provide a fuller and more defined look. For those with very little to no hair, Microblading can completely reconstruct your eyebrows for a full natural look. Due to the procedure being semi-permanent, the strokes will completely fade out due to the natural shedding of the skin 1-3 years following the initial appointment. The rate of the fading is affected by skin type and facial care routines. Oily skin or skin exposed to harsh facial scrubs tend to fade at a faster rate. A touchup is required 6 to 8 weeks following the initial appointment to reinforce the color retention. Annual touch-ups are recommended to redefine the shape and keep the eyebrows looking crisp. Before the procedure begins, a topical anesthetic is used to numb the area. After the first pass of strokes, a second anesthetic application is applied to further numb the skin. So is it painful? No. Most clients would agree that it is uncomfortable at most likening the feeling to scratching a sunburn. The result of the Microblading procedure is immediate. There is no downtime or recovery period. Some clients take a bit to get used to the look of full eyebrows on their once bare face. Immediately after the procedure, the application can look bolder, darker or more sharply defined than the end look will be. Don’t be alarmed. The final look will be a softer appearance once healed. Once the Microblading is fully healed, it is very low maintenance. Unlike eyebrow extensions that require meticulous maintaining, the semi-permanent quality of Microblading is hassle-free. You can rub your brows, wash your face, and skip the morning routine of meticulously drawing on your brows. Imagine going to the pool, heading to the gym, or just waking up and coming down for breakfast without having to draw on your face. You can wake up every morning with perfect eyebrows! 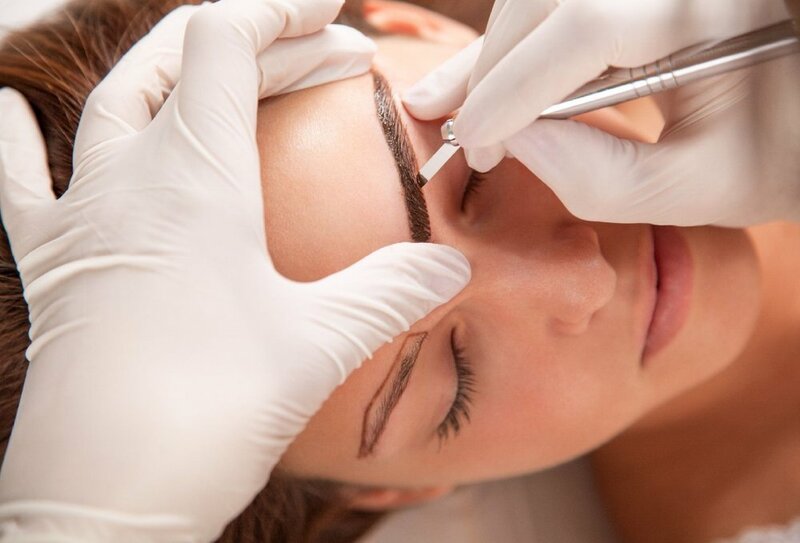 For a deeper look into exactly what to expect during your eyebrow Microblading appointment, see our blog Eyebrow Microblading: What to Expect During Your Procedure. If you have further questions about the procedure, please feel free to contact us! Alphonse Beauty Microblading Studio is a premier permanent makeup studio specializing exclusively in Eyebrow Microblading. We are located in Shelby Township, Michigan servicing the Metro Detroit Area. Visit our website at alphonsebeauty.com for before & after photos, pricing, FAQs, and more!